A sit and reach flexibility test box is a simple assessment that is designed to evaluate your hamstring and lower back flexibility (Source). While flexibility may vary throughout the body, the sit and reach flexibility test is a common way of getting an overall sense of an individual's flexibility. A sit and reach trunk flexibility box will enable you to conduct accurate fitness assessments. Sit and reach boxes will feature scales that provide centimeter and inch measurement scales, a footplate that is built into the box itself that effectively prevents any slipping, a maximum reach indicator, and commonly ship pre-assembled or are easily assembled without tools (Source). They make conducting fitness assessments so much easier- let's check out the 5 best-selling models. This Sit n' Reach box includes scales for: fitness, the Cooper Institute/YMCA, and AAHPERD. The scales printed in inches and centimeters. It's a Chinese-made product, and one user comments about having received one with misspellings on top, but other than that the consensus is that they are a breeze to use and make fitness assessments much easier to conduct. This particular model is made from powder-coated metal and includes a a built-in foot plate and uses a maximum stretch indicator that will remain until it is reset. In order to conduct a sit and reach test, it's important to do some light warm-up to get yourself or your client ready. The first thing you or your patient should do is to remove the shoes, fixing the legs in front of the body, have the toes pointed up with the feet just slightly apart and have them pressed up against the base of the sit and reach trunk flexibility box. Sit and reach boxes are specifically engineered to assess the hamstring and lower back flexibility of people. Especially useful to assess those who are in physical rehabilitation. It is a specialty sort of assessment, measuring flexibility and providing accurate readouts and evaluations of the lower back and hamstring muscle flexibility. Medical research has concluded that these assessments are highly valid, though there is greater evidence that their utility is more apparent for hamstrings than for back flexibility. Researchers also confirmed that besides just the hamstring and more back, it is also a useful test to assess the flexibility of the buttocks and calf muscles. Medical professionals and physical therapists counsel, however, that a particular joint's range of motion does not necessarily predict the range of motion of other joints. Many people actually build their own sit and reach test apparatuses. If you are particularly handy, you can build one yourself-all you will need is a boxlike structure with a measuring scale that is fitted to the upper surface. Check out this video to see how you can build your own. Interestingly, there are some other tests out there to assess flexibility and these include the Canadian sit and reach test, the wall sit and reach test, the YMCA sit and reach test, the back-saver sit and reach test as well as the V sit sit and reach test. When assessing information gleaned from this flexibility test, it's important to understand that extreme mobility scores are not be ideal. That is the say, that really high flexibility scores are not actually classified as excellent. Instead, a non-qualitative assessment diagnostic system that ranges from low to high is utilized instead for measurement. General findings have determined that on average women are more flexible than men. If you are going to build your own, the measurement scales need to be understood. There are actually two different sitting reach box methods of measurement. In the first one, the feet level is marked as zero-and if you achieve a score less than that it is marked as a negative number whereas any measurement that is past the toes will be noted as a positive number. The other scoring method which has gained some popularity and traction recently, uses the level of the feet and has them recorded as 23 cm or 9 inches. This results in all measurements yielding positive number. In terms of the actual scientific reliability and validity of this assessment- scientific tests have determined that it is only valid for lower back and hamstrings. When it comes to the reliability of this flexibility assessment, scientific consensus is that it will greatly depend on how much warm-up is allowed prior to conducting the test. Many of the testing norms that have been collected have been based on no warm-up period, however it has been found that the best results are usually achieved after individuals allowed to be warmed up prior to the test. For this assessment to be valid, you should standardize the warm-up prior to providing the assessment to a number of people that way the results can be valid across all participants. One person writing about his Novel Products flexibility tester says that in order to stay in line with the police department requirements, he needs to continuously assess himself to assure that he is flexible enough to meet department guidelines. 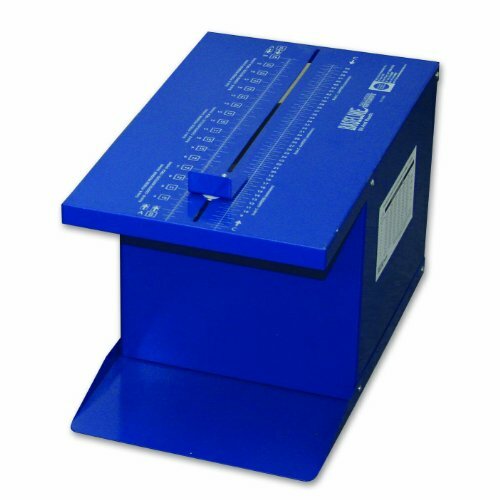 If you are looking to purchase a sit and reach flexibility test box, check it out our comparison table at the top of the page. While it is possible to build your own, if you are going to be conducting baton of tasks, it might be worth purchasing one of these flexibility testing boxes to make your life a little bit easier. These sit and reach flexibility boxes often used in schools to monitor the fitness levels of students, as well as for organizations like police departments where fitness requirements are particularly important. In general, these are particularly sturdy and durable devices that you will get a cut of use out of before running into any issues with them.